Two Stonehill College scholars are among the most recent at the College to have earned national recognition by prestigious educational foundations. Katherine Morelli ’16, a biology major and German minor, has been awarded the coveted Fulbright English Teaching Assistantship (ETA) and will spend the 2017-2018 year in Germany. Meghan Maciejewski ’18, a biology major, has been named a 2017 Goldwater Scholar, one of the most prestigious national awards for undergraduate students. Her award comes as a result of her work investigating the molecular mechanisms underlying the behaviors of marine organisms. The recognition comes on the heels of several other national honors for Stonehill. Most recently, the National Science Foundation (NSF) awarded Stonehill College its second Science, Technology, Engineering, and Mathematics (STEM) grant. The grant, worth just less than $1 million, will support Stonehill’s commitment to connecting economically disadvantaged students with a science education. Earlier this year, the College received a $300,000 grant from the Henry Luce Foundation’s Clare Booth Luce Program — the single most significant provider of scholarship support for women in science, mathematics and engineering. The Fulbright program awards grants to only about 1,900 U.S. students each year. As a Fulbright ETA, Morelli will help teach German students the English language while also showing them more about American culture. She is the fourth student from the College to receive a Fulbright ETA. The Barry Goldwater Scholarship and Excellence in Education Foundation awarded just 240 scholarships for the 2017-2018 academic year. Maciejewski is one of six Stonehill students to receive the honor in the College’s history. Both Morelli and Maciejewski worked alongside Professor Bronwyn Heather Bleakley in a lab that focused on genetic influences on the behaviors of guppies. That lab was funded by an $899,000 NSF Career Grant that Professor Bleakley received in 2015. In addition to Bleakley, both scholars credit a number of professors and advisors for their achievements, including Craig Kelley, associate provost for academic achievement; Rachel Hirst and Martha Hauff, associate professors of biology; and Professor Louis Liotta, professor of chemistry. “Professor Bleakley is still an academic, professional and general life mentor who taught me to empower myself in pursuing further education and various career options and to follow my passions,” said Morelli. 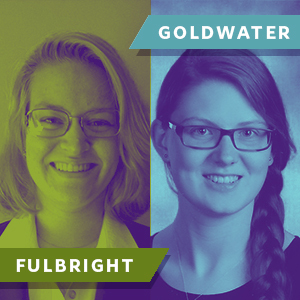 Nearly all the Goldwater Scholars intend to get a doctorate, including Maciejewski. She plans to get a doctorate in a branch of marine science, as well as to conduct research at an institution or an aquarium. Morelli plans to continue her education following her Fulbright year by completing her master’s in sociology while in Germany. She also hopes to one day obtain a doctorate in education.